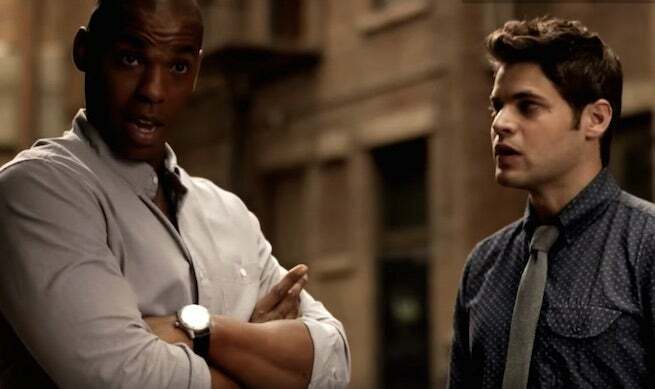 During a red carpet interview at New York Comic Con, Supergirl co-star Mehcad Brooks shared some insight about how much of James Olsen's backstory and supporting characters might play a role in Supergirl, how his version of "Jimmy" is similar to and different from those that came before -- and, yes, he teased that this reporter ought to know what sort of watch that is. "They're definitely bringing him into the heroics of it all, which I'm very happy about," Brooks said, noting that Jimmy's deeply-felt sense of justice helps motivate the character to help Earth's greatest heroes day in and day out. Sometimes, of course, Jimmy might need a hand -- that's what tends to happen when mortal men put themselves in the crosshairs. And if he does, it seems like he's got some blue-and-red-clad friends on speed dial. How so? Well, there's one particular thing we've already seen in trailers for Supergirl...he seems to have a fairly large watch. "Yeah, it's a special watch," he told us with a knowing look. Just when we thought he was ready to walk away to his next interview, he added, "You know what kind of watch it is, right? Yeah, you do." You can check out our interview below. Besides his signal watch, we know Olsen's past will come into play when his ex-girlfriend Lucy Lane shows up, as well. Beyond that...who knows? Supergirl premieres Monday, October 26 at 8:30 p.m. ET/PT on CBS.